Random Thoughts by Rebecca: Close Up Shot: Smile, say "Joy"
Close Up Shot: Smile, say "Joy"
Tonight is one of those nights that you hoped your life would turn out to be. 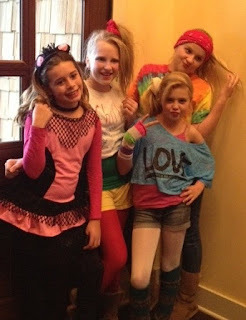 It's Halloween night and we staged a last minute party for the tween girl and her friends. A self serving move so I didn't have to get out on this cold wet night. One of my more genius decisions if I must say so myself. The girls are dressed in their costumes, mostly planned around how to wear too much make up and get away with it. Papa Murphy's provided those $6 Jack O Lantern pizzas, another act of genius. Each parent brought a bag of candy and Dude and Dad are staging a basement candy scavenger hunt. The new Taylor Swift CD is BLARING. There is laughing and dancing and painted pumpkins. Joy. Just Joy. It's in this moment that I remember to sit in the joy, let it swirl around me with it's magic powers. A close up shot of what I hoped life would be. I now understand that these moments are just that ..... moments. Fleeting in between the work and laundry and late for school and lost homework and grocery store and stuff. I remember being pregnant and dreaming of what kind of family and what kind of life we would build. I pictured this. I didn't know these would be the close up shots. It's easy to get discouraged when you look at life through the wide angled lens and those tough spots and work seem to line up a little too long. Then God tosses you a close up shot so beautiful and perfect you realize you got just what you asked for. Joy. In tiny little still frames of fabulousness.